"The best inheritance you can leave your sons, the richest dowries you can prepare for your daughters, is a truly Christian upbringing." "Having children is a matter of nature; but raising them and educating them in the virtues is a matter of mind and will." 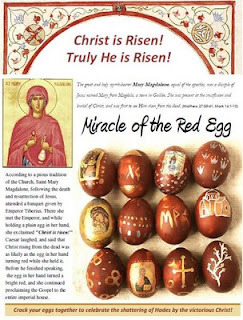 Here's a look at the pious custom of red eggs in the Orthodox Church for you and your families to enjoy. Where did the tradition come from anyway? It seems there are a few possible answers to this question...of which I prefer to believe in the miracle that God worked through His handmaiden, Saint Mary Magdalene (whom by the way is often wrongly attributed as the prostitute who anointed Jesus' feet and wiped them with her hair - Here is an Orthodox Wiki for a well cited clarification). then dip them to dye them red, and afterward, burn off the wax to reveal the design underneath. This is a wonderful craft for older kids to try. Ukranian Egg Kits are available online. 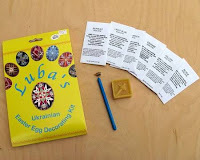 The simple wooden tools for the wax are called "kistkas"
LASTLY - remember, eggs and eggshells from the Church that have been blessed should not be thrown away! Please gather them to be burned with your holy items and ashes buried. Thanks for this - the kids always love the red eggs! This is fantastic! I can't wait to print a bunch of these out for the kids at our church. Thanks Elenie and hope you're having a blessed and fruitful Lent! Christ is Risen! Good job, Elenie! I am so happy for you and for me: I need all the rescourses I can for my two little girls. Contrary to what some might suppose, the elevation of the ubiquitous egg is not a modern commercial hype or based on an ancient pagan belief. 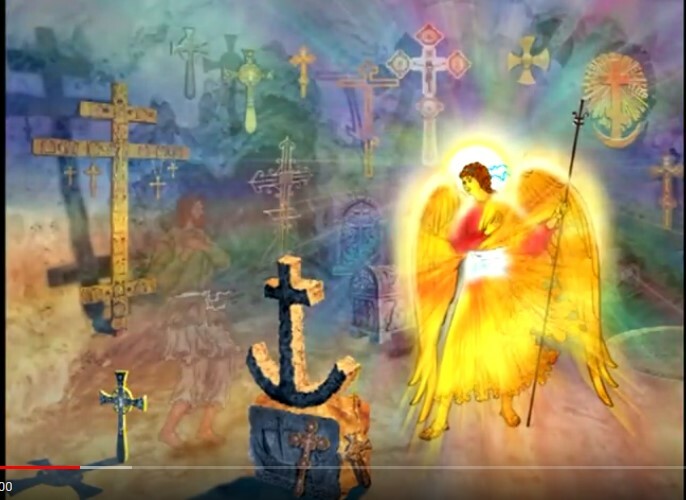 In orthodoxy has deeper meaning. It is rooted in the earliest days of Christianity and other religions, toο. The obvious implication is that the egg symbolizes the hatching of new life, the resurrection and rebirth of humanity. An early tradition embraced by the Greek church calls for coloring the eggs red to symbolize the blood sacrifice of Christ. In the early days of Christianity, the poor would wake up every day and have to find something to eat, so, if you were invited by someone to share a meal, you were sharing your life. That meal of life was often simple: a divinely nutritious and ever-so-ordinary hard-boiled egg. Orthodoxy is the perfect communication between humans and God. I am doing blogging for the first time in my life but I wanted to share something with you. Please forgive my ignorance. Our Church Bookstore published this educational Paschal Cube for kids in a form of a greeting card last year. PLease check the short youtobe video.